“Race you!” Nancy yelled. She pedaled up the steep hill to her house but was nearly out of breath. Bess and George rode behind her on their bikes, trying to keep up. Nancy pushed as hard as she could. She leaned forward, gripping the handlebars. George and Nancy were neck and neck. As they climbed to the top of the hill, the rest of the neighborhood came into view. The street dead-ended, with just five houses up ahead. Nancy pedaled as fast as she was able to, but George was faster. Just as the road flattened out George pulled ahead. She threw one arm up and hooted. “I did it! George Fayne is the winner!” She laughed. Nancy smiled. She’d known her best friends, Bess Marvin and George Fayne, since before they could talk. Bess and George were cousins, and they loved doing everything with Nancy. Together they rode bikes, had sleepovers, and danced around Bess’s room to silly songs on the radio. They spent summers swimming and camping, and winter breaks building snow forts. But their favorite thing to do was solve mysteries. Together they formed the Clue Crew. It seemed like they were always finding cases in their hometown of River Heights. Bess rode up beside them. The girls paused at the picket fence, which was covered in pink blooming flowers. The front door was open and the sprinkler was on. Those seemed like sure signs that Miss Bouret had returned from her two-week-long trip to Paris. Nancy glanced at the rosebushes that lined the front of the house. Mimsy Bouret, one of Nancy’s favorite neighbors, had a garden that looked like it was out of a magazine. There were blooming plants everywhere. Mimsy loved to walk around her garden, teaching Nancy and her friends the names of all the different plants. There were gardenias, lilacs, hydrangeas, and tulips. Her most impressive flowers were her roses, though, which she put Nancy in charge of while she was away. Every afternoon Nancy carefully watered the plants. She always made sure to give them just the right amount. 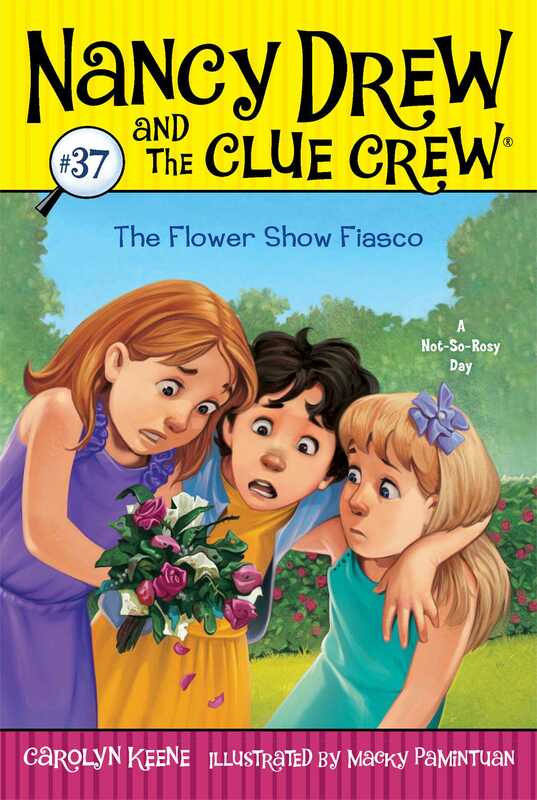 Taking care of Miss Bouret’s garden was a big task, and Nancy worried that she might mess it up. But the peach roses still looked perfect. Just then the front door opened. “Hello, my little darlings!” she cried as she sashayed out of her house. Her red curls were piled on the top of her head and she wore a floral blouse with lace around the collar. The entire four years Nancy had known Miss Bouret, she’d never seen her in anything except flower-print shirts. Sometimes it seemed like everything she owned was covered with tiny roses or blooming lilies, even her socks. “Mmmm . . . chocolate,” Bess said. She raised her eyebrows at Nancy. “In fact, I brought you back some as a thank-you.” Miss Bouret held up a gold box in her hands. “You took such great care of my beautiful babies. I wasn’t sure if I could leave them for two weeks, especially with the annual Garden Society Show just around the corner. But they look better than they ever have. Thank you, Nancy. Or as they say in French . . . merci!” She leaned over and kissed Nancy on both cheeks. “You’re very welcome. I was happy to, really.” Nancy blushed. She looked down at the gold box in her hands. It was decorated with a bright pink bow. “Tell us more about France,” George said. She inched closer to Mimsy. They always loved hearing about her travels. When she went to Africa the previous year, they’d listened to her talk about the lion pride she saw on safari. She’d spotted hippos and monkeys, and even come within a few feet of a giraffe. Miss Bouret stared off and smiled. “Oh, it was just . . . mesmerizing. I found a little cheese shop on the Seine. I must’ve sat there for hours, talking to the waiters and tasting everything in the place. Paris is just divine. You girls will have to go once you’re old enough.” She clasped her hands to her heart. It was then Nancy noticed she was holding a thick beige card. Mimsy handed Nancy the thick piece of paper. Bess and George huddled around her. You’re Invited to the 16th Annual Garden Society Show, it read. Nancy scanned the details. The event was taking place next weekend at Le Chateau, one of the fanciest spots in River Heights. Nancy had heard of it only once before—it was where her second cousin had gotten married. “It means we’re very important people.” George smiled. She bounced up and down on her toes as she said it. The girls glanced sideways at each other. A famous chef, beautiful flowers, and the fanciest country club in all of River Heights. It wasn’t even a question. “Yes!” the girls cried together.